HT MPEG Encoder 7.0 Pro Author is a product that is capable of an encoder with high compression rate and fast conversion, and shows its true performance when used with a Intel MMX products. It is an easy-to-use encoder Features - Faster Encoding Speed and Improved Picture Quality. - WMV (Version 9) and AVI Output Capability. - Enhanced DirectShow Support, most of the files playable with Media Player can be converted. 1) High Execution Performance. Best MPEG Encoding – Great Picture Quality, High Compression Rate, and Fast Encoding Speed. 2) Supports AVI & DV-AVI Input. 3) Supports MPEG Output for VCD, SVCD, and DVD. 4) Many predefined MPEG-1 and MPEG-2 profiles. 5) Supports batch processing for multiple encoding. 6) Conversion range can be specified on the source file (by using the mouse and keyboard). 7) Video filters can be applied to the source file (20 default filters are provided). 8) Adds a sequence header output menu for each GOP when converting MPEG 1/2. 9) MPEG2 interlace encoding capability. 10) MPEG 1/2 elementary stream generation capability. 11) Additional program information, title, description, copyrights, etc. can be added when generating WMV files. 12) Capable of generating AVI files by using the video and audio compressors installed in the system. 13) Supports interlace encoding. 14) Supports aspect ratio selection. 15) Supports screen inverse mode. 16) VOB conversion stabilization. 17) Discs can be created in NTSC or PAL video format and DVD, VCD or SVCD video format. 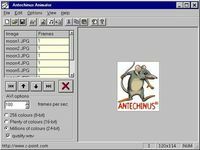 Changes: Now HT MPEG Encoder 7.0 Pro Author has the burning function with authoring that allows saving files in VCD, SVCD or DVD titles using a CD-RW burner or DVD burner.